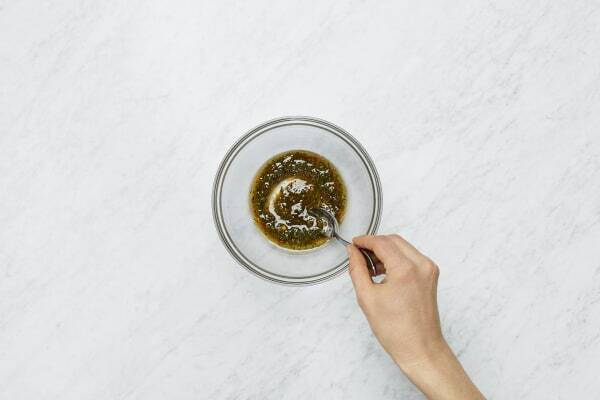 Chimichurri is the perfect condiment: it’s bright, tangy, herbaceous, and so versatile. Cilantro, garlic, and lime provide punchy flavors that lift everything it touches to new, delicious heights...so why should steaks have all the fun? 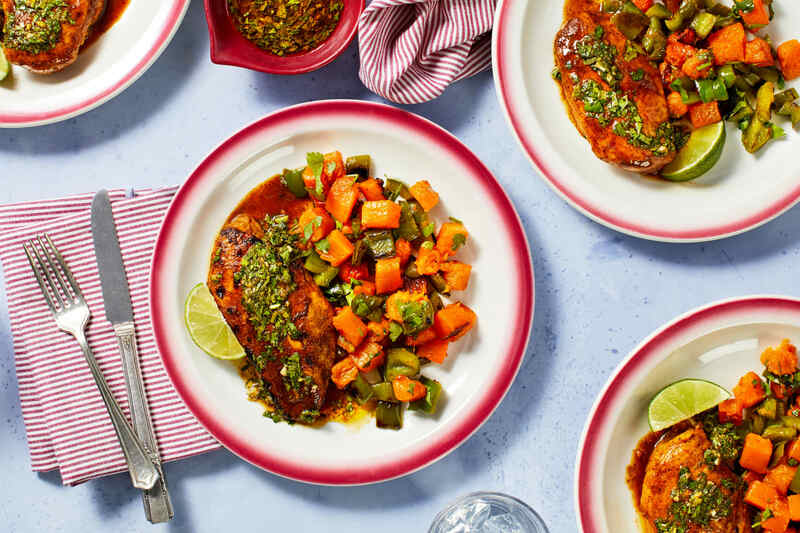 This week, chimichurri is drizzled over chicken cutlets, along with a lime-spiked jumble of roasted sweet potatoes and green peppers. Don’t be surprised when you find yourself drizzling this sauce over fries or cheese, or spooning it directly into your mouth. Preheat oven to 450 degrees. Wash and dry all produce. 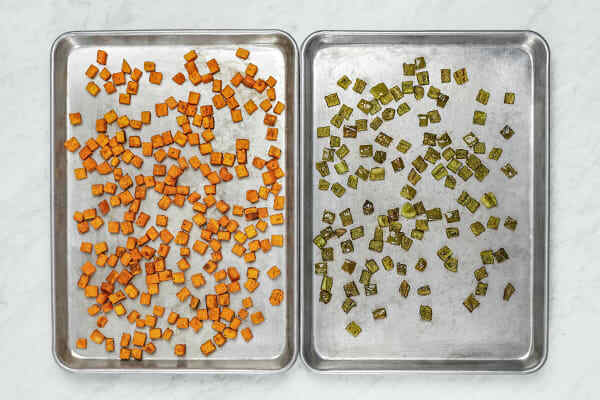 Dice sweet potatoes into ½-inch cubes. Core, deseed, and dice bell peppers. Meanwhile, quarter limes. Mince or grate garlic. 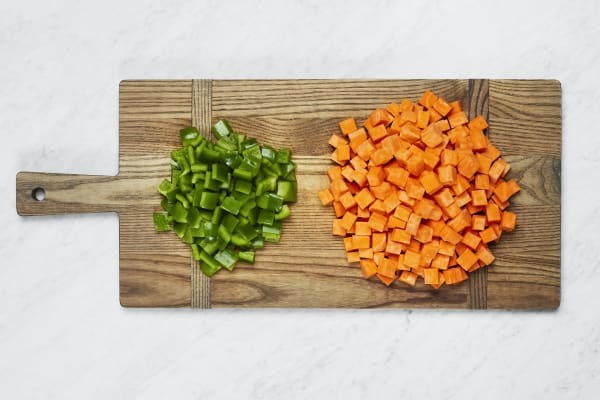 Finely chop cilantro; set aside 1 TBSP for jumble. In a small bowl, combine remaining cilantro, 1 tsp Southwest Spice, 2 TBSP olive oil, a pinch of garlic, and the juice from 1 lime wedge. Season with salt and pepper. Add more garlic, olive oil, or lime juice (to taste). Pat chicken dry with paper towels; season all over with salt, pepper, and 1 tsp Southwest Spice. Heat a drizzle of oil in a large pan over mediumhigh heat. Add chicken and cook until browned on first side, 3-4 minutes. Flip and add remaining garlic. Cook until fragrant, about 30 seconds. Add stock concentrates and ¼ cup water. Cook until liquid has reduced by half and chicken is cooked through, 3-4 minutes. 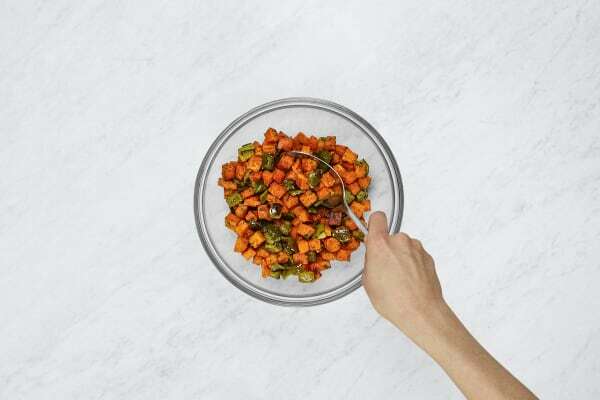 In a large bowl, combine roasted veggies, reserved cilantro, and a large squeeze of lime juice. Season with salt and pepper. Divide veggie jumble and chicken between plates. 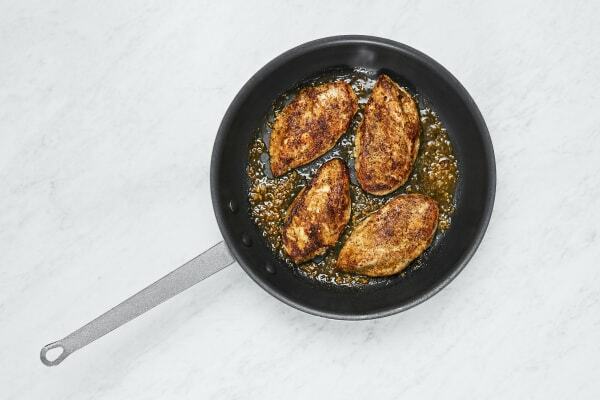 Spoon any remaining pan sauce over chicken. 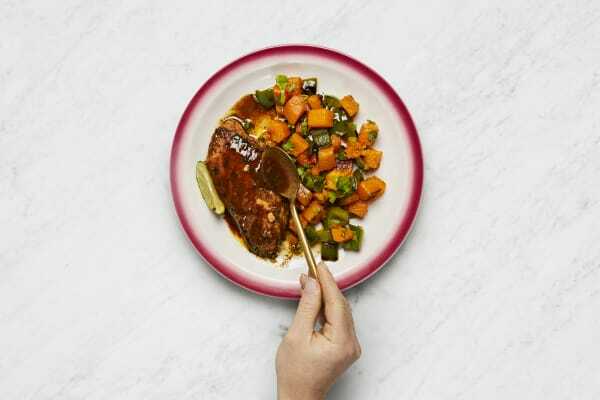 Serve with chimichurri and remaining lime wedges on the side.